This section provides an overview of what soap is, and why a developer might want to use it. It should also mention any large subjects within soap, and link out to the related topics. Since the Documentation for soap is new, you may need to create initial versions of those related topics. First we will create a service endpoint interface. The javax.jws.WebService @WebService annotation defines the class as a web service endpoint. Next we will create service endpoint implementation. We will create an explicit interface by adding the endpointInterface element to the @WebService annotation in the implementation class. Here are some set of rules 28.1.1 Requirements of a JAX-WS Endpoint that JAX-WS endpoints must follow. The getHelloSoap method returns a greeting to the client with the name passed to it. Next steps, we will run HelloSoapPublisher.java as java application. Then we will view the WSDL file by requesting the URL http://localhost:9000/ws/hello-soap?wsdl in a web browser. If XML data format is display at the web browser, then we are ready to go next step. If you get some kind of error message, maybe you need to use wsgen tool to generate necessary JAX-WS portable artifacts. We are not covered about wsgen tool here. Final step, we will create a client that accesses our published service. Note: Port number changed to 8000 in our web service client. The reason here is, I used Eclipse IDE, build-in TCP/IP monitor tool to trace messages (More Info: How to trace SOAP message in Eclipse IDE). For functional testing purpose try SoapUI | Functional Testing for SOAP and REST APIs. SOAP 1.2 obsoletes SOAP 1.1 it is therefore recommended to use SOAP 1.2 if possible. It is often build on top of HTTP/S and rarely on SMTP or FTP, though it would support it according to the protocol. Although HTTP is often used as underlying transportation protocol, SOAP uses only a limited subset of it. For sending requests it relies almost completely on HTTP's POST operation. GET invocations are theoretically possible since 1.2, though the document has to be passed as URI parameter and thus may exceed a roughly 3000 character boundary which is rejected by most frameworks. Also, security related settings are usually defined within a special SOAP header. Although SOAP and REST are called web-services, they are very different by nature. Some frameworks distinguish between WS (for SOAP based services) and RS (for REST based services). The following table gives a brief overview on the differences between both web service types. A SOAP requests consists of a SOAP envelop which has to contain a body element and may contain an optional header element. The header element is used to pass certain configurations to the service like i.e. WS-Security may defined that the message is encrypted or WS-Coordination/WS-Transaction may define that the message has to be executed within a transaction. The example above defined a request which invoked AddValues method with two arguments, FirstValue set to 1 and SecondValue set to 2 . The request resulted in an execution of this method on the remote SOAP server which calculated a value of 3 as a result which is encapsulated in a separate response element, which by convention is often the invoked method name plus a trailing Response string so anyone who is inspecting the response can conclude that this is the response of a previous AddValue method invocation. SOAP 1.2 allows for other transport protocols then HTTP as long as the binding framework is supported by the protocol. SOAP 1.1 is based on XML 1.0, while 1.2 is based on XML Infoset which allows to serialize the SOAP messages with other serializers then the default XML 1.0 serializer used by SOAP 1.1. This allows i.e. to serialize messages as binary messages and therefore prevent some overhead of the XML nature of the message. In addition to that, the serialization mechanism of the underlying protocol used can be determined via the data binding. The interoperability aspect was also fostered with SOAP 1.2 by defining a more specific processing model then its predecessor which eliminated many possibilities for interpretation. SOAP with Attachment API (SAAJ), which allows to operate on SOAP 1.1 and 1.2 messages, helped many framework implementors to process and create messages. Web Service Interoperability (also known as WS-I) is an interoperability guideline governed by some well known enterprises such as IBM, Microsoft, Oracle and HP to name just a few. These guidelines among others recommend to use only one single root element within the SOAP body even though the SOAP does allow to contain multiple elements within the body. WSI-BP is available in 4 different versions v1.0 (2004), v1.1 (2006), v1.2 (2010), v2.0 (2010) and defines interoperability guidelines for core web service specifications such as SOAP, WSDL and UDDI. Through the use of Web Services Description Language (WSDL), SOAP services can describe their supported operations and methods within a cohesive set to other endpoints. WSI-BP makes use of WSDL to define a narrower set then the full WSDL or SOAP schema would define and thus eliminates some of the ambiguity within the specification itself and thus improve the interoperability between endpoints. In order to advertise the available SOAP operations, their parameters as well as the respective endpoints to invoke to clients, a further XML based document is used called Web Services Description Language or WSDL for short. WSDL describes the service endpoint, the binding of SOAP messages to operations, the interface of operations as well as their types to clients. WSDL is, like SOAP, available in 2 versions which differ in their syntax slightly though express almost the same semantics to the client. A service section defines the concrete endpoints the service will listen for incoming requests. The binding section binds an operation to a concrete style and defines which message formats the server expects or the client can expect. The abstract section is composed of a portType block which defines the operations offered by the service and which messages are exchanged. The messages are specified in their on block and linked to the schema types the arguments and return values are instances of. Messages can declare parameters or return values to be in , out or inout . While the first two are quite simple to grasp the latter mimics the behavior of arguments passed by reference. As pass-by-ref is not supported in some languages this effect is often simulated via certain handlers. A graphical overview on the differences between both versions can be seen in the picture below. As can be seen from the image the message section got removed which is now contained in the interface section. Also, some of the elements got renamed, others have a different syntax but in general both WSDL version do basically the same with version 2.0 requiring a bit less writing overhead compared to 1.1. Besides the smaller footprint on defining SOAP based services via WSDL 2.0, the newer version also provides capabilities to define REST services though WSDL 2.0 or even WADL are NOT recommended for RESTful services as they contradict the actual idea behind it. 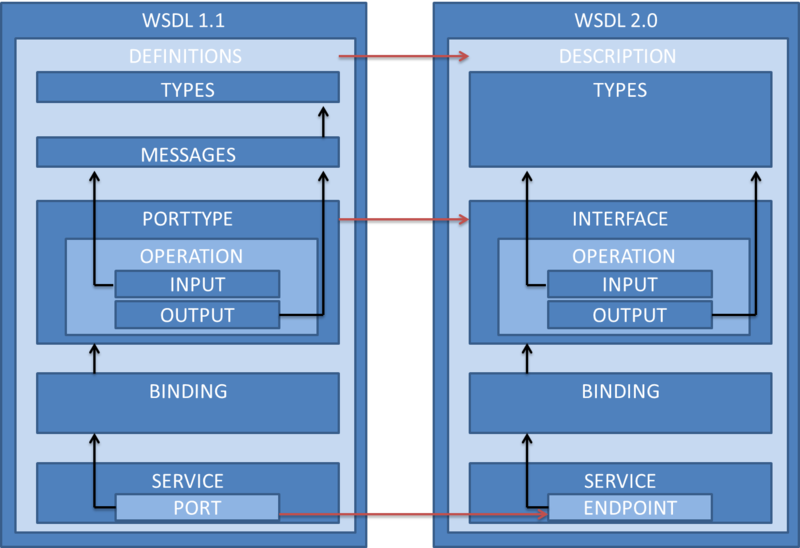 The WSDL binding section describes how the service is bound to the SOAP messaging protocol. The sample above used document as the binding style, which allows to structure the SOAP body the way we want as long as the resulting output is a valid XML instance. This is the default binding style and often referred to as Message-Oriented style . In contrast to document style, RPC style request bodies have to contain both the operation name and the set of method parameters. The structure of the XML instance is therefore predefined and can not be changed. In addition to the binding style the binding section also defines a translation model for bindings to SOAP messages in the name of literal or encoded . The difference between the two is, that literal model has to conform to a user-defined XSD structure, which can be used to validate the requests and responses, while the encoded model has to use XSD datatypes like xs:integer or xs:string but in exchange therefore has not to conform to any user-defined schema. This however makes it harder to validate the message body or transform the message via XSLT to an other format. The combination of the binding style with the use-model allows for actually 4 different message outcomes. A 5th entry is added to the list which is commonly used (though not really part of the standard). The section below gives an overview on the differences regarding WSDL or schema declaration and their impact on the resulting SOAP message format on changing either binding style or use model definitions. Does not make any sense therefore omitted. Universal Description, Discovery and Integration (UDDI) is an open industry initiative crated in 2000 which acts as XML based yellow-pages registry for web services which helps finding services that solve specific tasks. In order to find an appropriate service, a service needs to be registered first with a Web Service Registry such as the UDDI. UDDI works on SOAP message exchange and provides access to WSDL documents which can be used to invoke the actual web service. However, a big disadvantage of current UDDI is that it only allows to use one single criteria within a search statement. Certain implementors therefore modularized their UDDI implementations to allow for queries spawning multiple UDDIs simultaneously and then aggregate the returned results. In practice, however, UDDI is not used that often. Some are even saying that UDDI is dead since IBM, Microsoft and SAP shut down their UDDI services in 2005. SOAP/WSDL provide a wide range of tooling support and also allow to dynamically generate stub-classes for both clients and servers as the type of messages and data exchanged is well defined through the embedded or linked XSD schemata. While WSDL 2.0 has less overhead of defining web services, certain languages still have not adopted the new standard yet. I.e. in Java popular tools like wsimport (from Oracle/Sun) or wsdl2java (from Apache CXF) are not able to handle WSDL 2.0 descriptions properly. Therefore, for compatibility reasons it is still recommended to use WSDL 1.1. 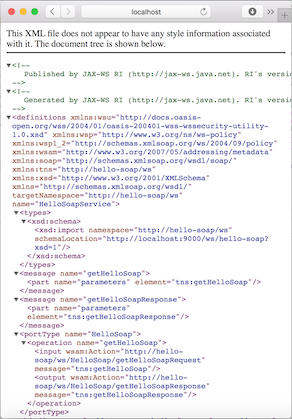 If you need to develop a WSDL 2.0 based SOAP service in Java have a look at wsdl2java from Apache Axis2 project. More popular nowadays, however, are either HTTP based API services, which mix HTTP operation invocations with clean human-understandable URIs and certain customizations to the protocol in order to get their job done, REST based services, which fully comply to the actual recommendations, or own byte-level protocols, like i.e. OFTP2. SOAP is still useful nowadays if you can't map your task directly to resources, like HTTP/REST base services do, as the task to fulfill represents naturally an action or has to define certain transaction semantics. Also if you do not have the resources to define or implement your own protocol you are probably better of using SOAP. SOAP is especially useful if you have to deal with orchestration as the WSDL description in combination with UDDI allows to combine services dynamically.